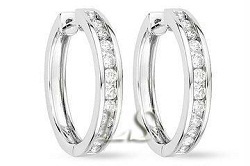 Want to buy some Italian white gold jewelry? Want to know the exact difference between white and ordinary gold? Our guide to Italian white gold gives you the facts & information you want to know. If you like wearing jewelry but consider the yellow colour of gold too showy, don’t worry, there are other options as well. The first and the most important one is white gold. White gold is considered to be as precious as yellow gold; it has the same properties, only its colour is different. Italian gold is a wise choice as Italians have great expertise in gold jewelry making. Pure gold is very soft and is not very durable. To give the gold more strength, the gold has to be combined chemically with other metal bases to form gold alloys. Different percentages of different metals in the metal base give different colours to the gold. White gold gets its white colour because of at least one white metal present in the metal base. Mostly nickel or palladium is used to give white gold its white colour. White gold usually is an alloy of nickel, copper and zinc and might contain traces of platinum which gives it more weight and more strength. White gold basically has a dull shine. In order to give it a bright shine, white gold products are coated with a thin layer of rhodium. This process is called rhodium plating. The pure gold content in white gold products is measured in carats just like yellow gold. The finer white gold products usually have at least 17 carat pure gold content. White gold is looked after more or less the same way as yellow gold products. It has a thin layer of rhodium plating, which can wear off after continual use. This can be prevented by rhodium plating the white gold products after at least every six months. A little effort will keep your white gold jewelry in perfect condition. Italy has an impressive gold history. Its history can be traced back almost 3,000 years ago when the people of Tuscany started making gold ornaments. Since then, there has been no looking back. Gold art grew and evolved in Italy at a great level. The ancient designs are still well loved and are very carefully duplicated to keep their heritage alive. Even the various Goldsmith Designer Schools impart a combination of traditional and contemporary processes and techniques for the same purpose. Italian goldsmiths produce exquisite designs with superb craftsmanship, which is why Italy has enjoyed the number one position for producing fine gold products for a long time. When people started using white gold for jewelry, the crafty Italian goldsmiths showed the same excellent workmanship in producing fine and flawless white gold jewelry that they were famous for and it holds true to this day. At one time, white gold was not that common, but now people are using it for a variety of reasons. It looks classy, it is durable and tiny scratches can be buffed away with rhodium plating easily. Several kinds of white gold chains, earrings, bracelets, rings, anklets, charms and many more can be easily bought. Usually 14 carat or 18 carat white gold products are available. Their prices vary considerably depending on their weight, size and design. Happy Shopping!! !